Springfield, MO. 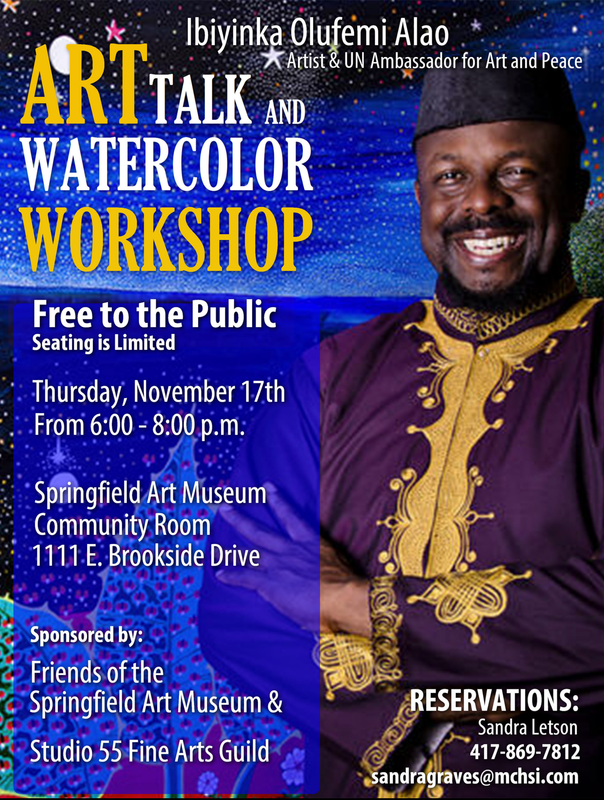 (November 2, 2016) - Ibiyinka Olufemi Alao, Artist and UN Ambassador for Art and Peace will give a free public program and watercolor workshop, sponsored by Friends of the Springfield Art Museum and Studio 55 Fine Arts Guild, from 6:00 – 8:00 p.m., Thursday, November 17, in the Springfield Art Museum Community Room, located at 1111 E. Brookside Dr., Springfield, MO. Ibiyinka will be covering two main topics: “Visual Storytelling” and “Art is Frozen Music” which is the idea that art can visually astonish, as in painting, sculpture and architecture, but can also have musical and poetic components of dance, drama, and writing. He will show and discuss five of his paintings, give a short musical demonstration on the African Djembe drum. Ibiyinka's "Girls and a Greener Environment" was the winner of the 2001 United Nations International Competition. His 2016 painting entitled "Eternity in Our Hearts" was awarded the grand prize for the Kids are Authors contest sponsored by Scholastic, and is the basis for the children's book "Ibi's Fireflies." His paintings have been exhibited in the Metropolitan Museum of Art, the Smithsonian Museum, the Martin Luther King Jr. Art Center, and the United Nations Headquarters. In addition to his presentation, Ibiyinka will lead a watercolor workshop where participants will create a small watercolor painting. This workshop is most appropriate for adult artists. Artists will need to bring their own supplies including: watercolors, paintbrushes, 11x14 watercolor paper, drop cloth, and tape. This event is free and open to the public, however seating is limited. To reserve a place call Sandra Letson, President of the Studio 55 Fine Arts Guild at (417) 869-7812 or email sandragraves@mchsi.com.